November 2, 2007 - ILL 11/02/2007 (suburbanchicagonews) "Stacy Peterson case a tangled web"
"His mother, Betty Morphey, said in a phone interview with The Associated Press that her son and his wife, who had been studying pre-nursing at Joliet Junior College, got along "very well." "He's very sad," said Morphey, who declined to comment further." ILL 11/10/2007 (colbyfiles.blogs) "Drew Peterson’s Mom Speaks Out in Fox Exclusive"
"I expected all of my wives to be like my mom, meticulous housekeepers, and they weren't." "Carol was a good woman and I was unfaithful." ILL 12/03/2007 (www.people.com) People Magazine, "DID HE KILL TWO WIVES?" "From Peterson's own words to PEOPLE, and the record of his four toubled marriages, a portrait of the ex-police sergeant emerges - confident and charismatic but also controlling and sometimes abusive, drawn to vulnerable woman and eager to buy them things to make them feel secure, but just as quick to intimidate them to get his own way. The eldest of three children, his father was a strict ex-Marine, and his mother a diligent housewife. "My dad would get up to go the bathroom in the morning, and my mom would have the bed made," says Peterson. "I expected all of my wives to be like my mom, meticulous housekeepers, and they weren't." Peterson was 20 when he married his high school sweetheard Carol Brown, then 17; when she had a miscarriage, Peterson was "very supportive," Brown, 50, told the Chicago Tribune. But after six years and two sons together, she discovered he cheated on her, and they divorced in 1980. "I take full responsibility for that," Peterson says. "Carol was a good woman and I was unfaithful." "All of this is not necessary," she said. "She [Stacy] didn't have to walk out and leave everybody stranded and not knowing what to do. All she has to do is call and say she's fine." "I would tell her I'm ashamed of her for putting the family through this," Morphey said. "She knows where she is." "Morphey said she didn't know anything about allegations of adultery that Peterson's former wives have leveled against him." ILL 11/20/2007 (www.suntimes.com) "'He would never hurt anyone'"
"Drew Peterson's mom, Betty Morphey, had strong words Monday for Stacy Peterson, who she believes left Peterson and their two children and ran off with another man, as her son contends. "I would tell her I'm ashamed of her for putting the family through this," Morphey said. "She knows where she is." "In a lengthy interview, Morphey, 79, spoke about how heartbreaking she finds the insinuation that her son would harm anyone. Stacy's family believes the young mother would never have left her two children and fear she is dead. "I could swear on a Bible that he would never hurt anyone at any time," Morphey said. "I'm proud he's my son and I feel so bad he's got to go through all this because of her. She was just too young." 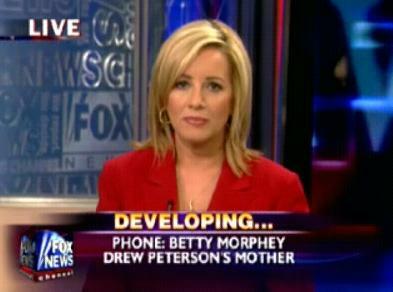 There is a 30-year age difference between Drew and Stacy Peterson." "On Monday morning, Morphey watched her son's ex-wife Carol Brown on ''Good Morning America'' instead of Peterson and his attorney on the "Today" show." - "Morphey said Monday that Brown was a "lovely girl" who spoke the truth about her husband on morning television. "They got married so young," Morphey said. Drew Peterson and Carol Brown married when she was still in high school and he was a recent graduate. "That's why that didn't last. I wish he would have stayed married to her forever." Morphey said she didn't know anything about allegations of adultery that Peterson's former wives have leveled against him." "Had Morphey watched "Today," she would have seen her son say he was "worried" about his missing wife, Stacy, but again maintain she ran away with another man. "Your wife leaves you . . . and you're very much worried about her," said Peterson, who has been named a suspect in his wife's disappearance. Peterson also wanted Stacy, his fourth wife, to "publicly show herself so we can clear all this up." "I'm proud he's my son and I feel so bad he's got to go through all this because of her." ILL 11/20/2007 (chicagotribune.com) "Mother of Drew Peterson says wife ran off, is 'ashamed'"
"Betty Morphey says her son, Drew Peterson, never would harm anyone. 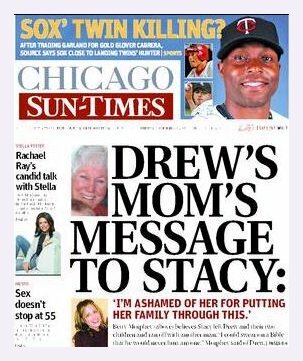 "I'm proud he's my son and I feel so bad he's got to go through all this because of her," Morphey told the Chicago Sun-Times for a story in Tuesday's editions. "She was just too young." 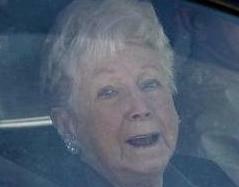 - "I would tell her I'm ashamed of her for putting the family through this," Morphey said. "She knows where she is." "Morphey said she has lost weight and is sick over others' suspicions her son had anything to do with his third wife's death or fourth wife's disappearance. "All of this is not necessary," Morphey said. "(Stacy) didn't have to walk out and leave everybody stranded and not knowing what to do. All she has to do is call and say she's fine." March 20, 2008 Peterson's mother subpoenaed ILL 03/20/2008 (www.nbc5.com) "Drew Peterson's Mother Called Before Grand Jury"
"Drew Peterson's mother has been subpoenaed to testify in front of a grand jury investigating the disappearance of her daughter-in-law." - "Family members are fighting Peterson's mother's subpoena. They said she suffers from Alzheimer's disease"
"It's simply harassment" ILL 03/20/2008 (www.suntimes.com) "Drew's parents talk to grand jury"
"Drew Peterson's parents don't know what happened to his missing fourth wife. That's what his mother and stepfather, Betty and Al Morphey, told reporters on Thursday after they testified in front of the Will County grand jury investigating Stacy Peterson's Oct. 28 disappearance. "I have no idea. Do you?" Al Morphey replied when asked by a reporter if the couple knew where Stacy was. Neither would comment on what they were asked about during their grand jury appearance, though Betty Morphey said she believed Stacy still could return home safely." - "Peterson's parents offered little other information to reporters. "You guys are vultures," Al Morphey said as he and his wife walked away." "Peterson said Thursday he's "pretty pissed off" his mother and stepfather were called before the grand jury, saying they have no information about Stacy Peterson's disappearance or Savio's death. "It's simply harassment," he said. "They're old folks who don't have anything to do with anything." "She [Betty Morphey] later asked a photographer for the pictures he was taking of her. "We want 10 copies of each," she said. "We didn't do nothing." "Al Morphey is the father of Thomas Morphey, Peterson's stepbrother, who allegedly has said he helped Peterson remove a large blue barrel from his bedroom" ILL 03/21/2008 (www.southtownstar.com) "Drew's mom, stepdad testify"
"Drew Peterson's mother and stepfather appeared Thursday [03/20/08] before a Will County grand jury in what the embattled ex-cop believes was nothing more than an attempt to irritate him. 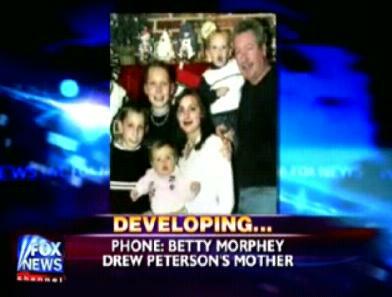 Peterson's mother, Betty Morphey, and stepfather, Albert Morphey, would not discuss their testimony." "But Stacy Peterson's mother-in-law is optimistic the young woman might return. "We hope so," said Betty Morphey as she and her husband walked to their car in a downtown Joliet parking lot. She later asked a photographer for the pictures he was taking of her. "We want 10 copies of each," she said. "We didn't do nothing." "Al Morphey is the father of Thomas Morphey, Peterson's stepbrother, who allegedly has said he helped Peterson remove a large blue barrel from his bedroom to his vehicle hours after Stacy Peterson last was seen alive. Al Morphey refused on Thursday to talk about what role Thomas Morphey may have played in Stacy Peterson's disappearance."